How One Of The World's Toughest Creatures Can Bring Itself Back To Life : The Two-Way The tardigrade, a strange animal smaller than a grain of sand and with hooks for feet, can survive in a dried-up state for a decade. Its secret might help improve how drugs are shipped and stored. A tardigrade, known as a water bear, is shown magnified 250 times. These tiny aquatic invertebrates can go without water for 10 years, surviving as a dessicated shell. Microscopic, bear-shaped animals called tardigrades are one of the most resilient animals on earth. Known colloquially as water bears, they can survive freezing temperatures, radiation, even a trip to outer space. The creatures are famous for their ability to withstand extremely dry conditions. Water bears can go without water for 10 years, surviving as a dessicated shell. Just how they come back to life when their environment is friendlier has baffled scientists for years. 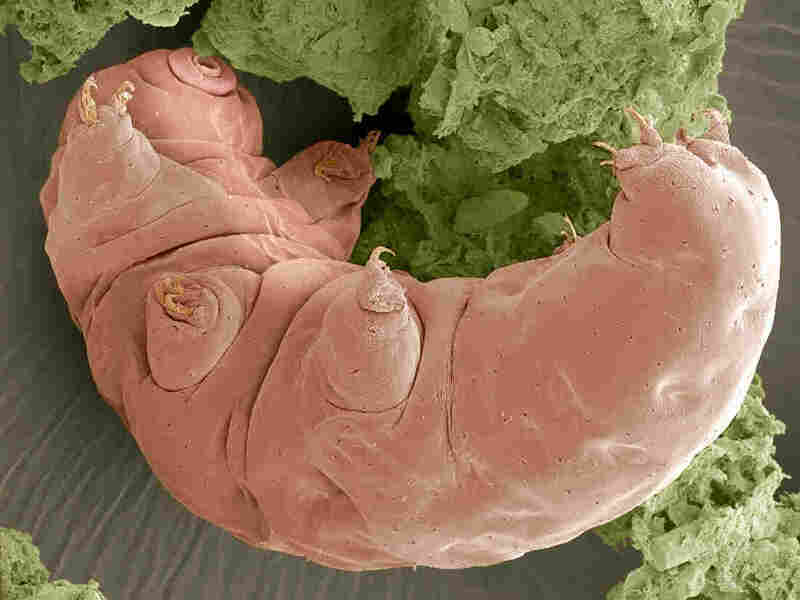 Scientists initially thought tardigrades were surviving desiccation by using a sugar called trehalose. In bacteria and fungi, trehalose can turn the inside of cells to a glass-like matrix that keeps proteins from being damaged in super dry conditions. The process, called vitrification, allows dried-up organisms to hold proteins and molecules together until the organism is rehydrated and can get back to business. But when they looked closely, researchers found that trehalose was barely detectable in water bears, and that some species don't have the ability to make the sugar at all. So researchers at the University of North Carolina at Chapel Hill set out to find what the tardigrades were doing to regenerate. Led by UNC postdoctoral fellow Thomas Boothby, the team of biochemists started by drying out tardigrades and determining which genes were "switched on" in response. One group of proteins called IDPs, or intrinsically disordered proteins, stood out. "When we looked at which genes are activated most during that drying stress, the genes that encode the disordered proteins jumped right to the top of the list," Boothby said. IDPs are the oddballs of the protein world. Most proteins have a stable 3-D structure that's important for their function, but intrinsically disordered proteins have no set shape. That means they're flexible and can wiggle and move to bind things in the cell. Boothby says IDPs are like "wiggly spaghetti springs where they are constantly changing shape." 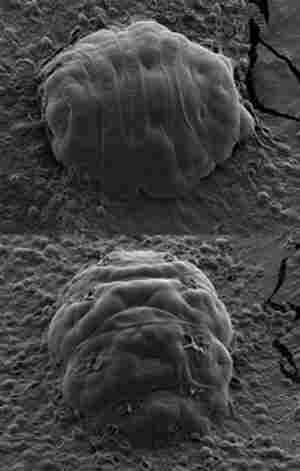 Water bears that lacked functional IDPs couldn't survive extremely dry conditions, as the biochemists noted in a study published Thursday in Molecular Cell. Boothby found that IDPs form bio-glass much like trehalose does in bacteria and fungi. Essentially, when the water bears get stressed, they start cranking out IDPs that fill up the cells and form the protective matrix. Once they determined that IDPs prevented tardigrades from drying up and dying, the researchers put IDPs in yeast and bacteria to see if it could protect them as well. The borrowed tardigrade proteins increased the ability of some bacteria and yeast to survive desiccation by 100-fold. That means that tardigrade proteins are functional even when you put them in other organisms. Boothby thinks these proteins could be useful in pharmaceutical storage. "A lot of protein-based pharmaceuticals are very effective but also very unstable," he says. To keep them stable, some drugs need to be kept very cold as they're transported and stored. This makes shipping and storage very expensive – which can be an insurmountable challenge in developing countries. Boothby thinks that using the tardigrade proteins to help stabilize the medicines could eventually bring down that cost. "Essentially, what we envision is using these tardigrade proteins to stabilize sensitive proteins in a dried state, and then being able to ship and store these lifesaving drugs all over the world at room temperature." So water bear proteins might bear benefits for humans, too.